Nobody wants to leave loved ones without the elder care services they need, but often busy schedules and even distance prevents you from visiting your relatives as often as you’d like. It’s important that, even if you can’t make the trip, somebody makes sure that your elderly family members are taken care of. While nursing homes and assisted living facilities are viable options, why separate your parent or grandparent from the life they’re used to? 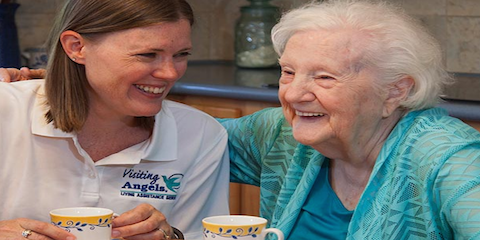 Visiting Angels, serving Orlando Downtown East and Winter Park, FL, will help your elderly relatives with everyday activities of daily living without forcing them to leave their homes, freeing you from worry and your loved ones from stress. Visiting Angels offers a variety of elder care services to make your relatives’ lives easier and more pleasant. Their caregivers provide both dressing and grooming assistance, an often-overlooked area of senior care that provides a boost of self-confidence. Visiting Angels at Winter Park also provides essential day-to-day life services, including meal preparation, light housekeeping, and even errand running so that your loved ones can maintain their normal life with the extra help they need. Visiting Angels caregivers are known for their companionship. Many families, while they’d prefer to live nearby, just aren’t able to visit their senior family members often. Visiting Angels caregivers provide much-needed company. They’re available mornings, afternoons, and nights, as well as weekends and holidays, so a friendly face can always be scheduled to visit your elderly loved one. Keep your loved ones safe by hiring friendly caregivers to look after them. Visiting Angels will provide your elderly relatives with the care they need and deserve, whether it’s assistance walking or reminders to take their medication. For more information about their elder care services, call (407) 236-9997 or visit their website today.